Samsung Pay is not so vast, but it has one of the biggest potentials when compared to the likes of Apple Pay or even Android Pay. The service is currently available in a handful of markets across the globe, among them the U.S., China, Australia, Spain, Sweden, and India. One thing that makes Samsung Pay a better option than both Android Pay and Apple Pay is that it supports both NFC and MST, which means it could be used in just about every other terminal that doesn’t support the former. Another major advantage that Samsung has over, Apple, for instance, is that it has more devices in the market in almost every corner of this world. 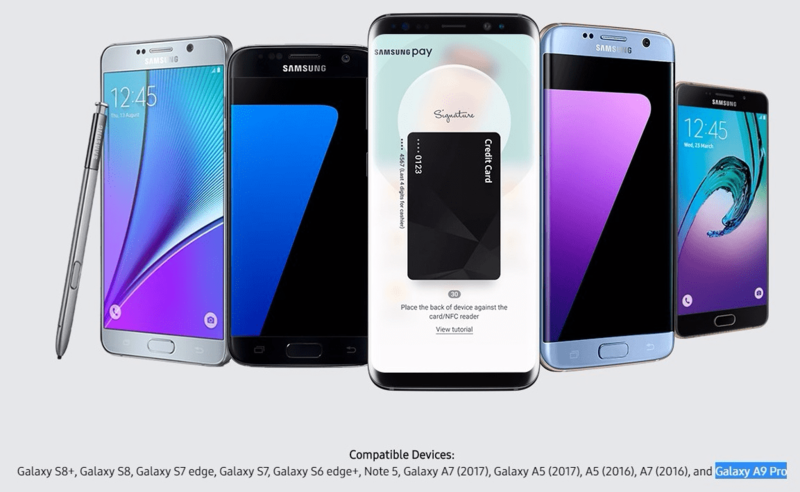 However, only a handful of these devices is currently compatible with Samsung Pay. Initially, Samsung Pay was only available to a handful of Sammy phones, which are mainly flagships. Before the release of Samsung Galaxy S8, the service had been limited to the likes of Galaxy S7, Galaxy Note 5 and Galaxy S6. Since it made its debut in India not so long ago, Samsung Pay has only been available on a measly eight devices. These include the aforementioned Galaxy Note 5, Galaxy S7 series and the 2015 Galaxy S6 Edge+ as well as the midrange Samsung Galaxy A5 2017, Galaxy A7 2017, Galaxy A5 2016 and Galaxy A7 2016. Well, this is list is about to grow insignificantly bigger thanks to the addition of the Galaxy A9 Pro. Just like the number of supported devices in India is still small, the number of banks that are also supported on Samsung Pay is still small as well. The likes of Axis, ICICI, HDFC, Standard Chartered and SBI are on board already, with this figure expected to grow with time.